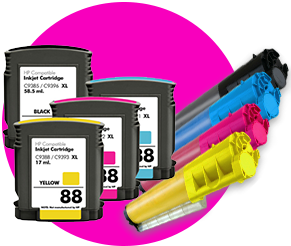 If you don’t want to throw your business funds away buying ink cartridges and toners of big names in the printing industry, it is better to get them from a reputable third party provider of ink cartridges and toners in Ireland. Although the ink cartridges and toners of third party providers do not come from the original manufacturers they are as good as in terms of quality, reliability, and functionality. Not only do you get cartridges at very affordable rates, you also get cartridges that have successfully passed the pro stringent quality standards. Do not get fooled by the dire “warnings” of printer manufacturers that block you from using ink cartridges of third party providers. You need to understand that these printer manufacturers want you to come to them for printers and related accessories. They don’t leave any stone unturned in making you believe that using products of third party provider is going to “kill” your printer. Buying ink cartridges and toners of original manufactures can dig a hole in your pocket. They are very expensive and it would be very difficult for everyone to afford them. Printers have become a necessity in today’s world and we use them on regular basis. Unless you want absolute color accuracy in your prints, it is better to use third party ink cartridges for regular printing requirements. From a third party provider, you can buy ink cartridges and toners compatible with printers of various brands. So, whichever printer you are using, just contact DublinCartridge and get the right ink cartridge and toner for your model. Why buy from a third party provider? You get quality Ink cartridges and toners for your printers at lowest price possible. Did you just ask how? Well, third party providers buy all their ink cartridges in bulk to pass the savings on to you. Even if you do not place a big size order, you get to avail decent savings. As soon as your order gets confirmed, your order is shipped from the warehouses. You get to choose cartridges from various printer models of reputed brands such as Hewlett Packard (HP), Canon, Epson, Brother, Dell, etc. You can save even more money by just signing up for their email newsletter. They regularly send out coupons for deals on ink cartridges that you can take advantage of. For all your cartridges related needs, contact a third party provider and save big.